Call for Quality At-Home Care! Since 2010, Meadows Home Health Services has offered quality, safe, cost-effective home care services to patients in Las Vegas, Nevada. Our skilled, caring staff provides the highest standards of medical care. We will tailor a program to best address your at-home care based on your particular needs. 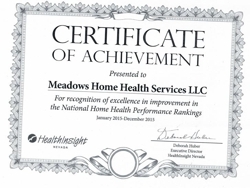 Why Choose Meadows Home Health Services? Call our home care professionals today at (702) 666-6338 to find out more about our services! Copyright © 2018 meadowshomehealthlv.com All rights reserved.